Stinky Brumbles was busy unpacking a box of itching powder when the front door of the Joke & Novelty Emporium flew open, and in strode a trio of grim-faced men in dark suits. One of them slapped a fistful of pink, deflated whoopee cushions on the counter, while his partners stood behind him, staring contemptuously at a rotating display of fake poop and vomit. "Listen, Brumbles," the first man growled. 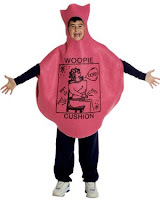 "You know what happens when anyone in this town tries to sell a whoopee cushion without our say-so? Bad things, Brumbles. Very bad things." One of the other men spoke up. "Here's some advice, pal," he said with a sneer. "If you want to stay in the simulated-fart game, you'll buy FartMor-brand whoopee cushions, and nothing else. Got it?" He cracked his knuckles menacingly. "Sure, boys," Brumbles replied, pressing a button hidden under the counter. "I don't want any trouble." Suddenly, a fish mounted on the wall began to sing, and this was just enough to distract the men. Quick as a wink, Brumbles hobbled each of them with a Chinese finger puzzle, and as they struggled in vain to free themselves, he locked the front door and closed the blinds. Now the terrified men began to realize they had greatly underestimated Stinky Brumbles. And they would pay dearly for their mistake, for over the next six hours, a vengeful Brumbles turned their world into a waking nightmare of joy buzzers and exploding cigars. This didn't end up in the basement of the Joke and Novelty Emporium, like that awful, awful scene in Pulp Fiction, did it? That tall, skinny dude, the crooked rent-a-cop in the movie, he was like one of the enforcers in this story, wasn't he? Man! He gives me the friggin' willies! I wanna cut his greasy face off with a rusty fillet knife, but I don't wanna get that close to him! That's some fairly disturbing imagery! Now, if you'll excuse me, I have to get back to watching a Discovery Channel special on the magic of angels and puppies.